With Beyonce, Take That and George Michael among the stars to have performed during the final, the last X Factor episode is always a glittering affair. But it seems this year Simon Cowell is determined to top them all, and has somehow persuaded popstar Prince to appear. It’s thought Simon has been after the reclusive star for some time, and has even offered to send a private jet to fly him to London for the show. ‘Simon Cowell had been trying to get Prince on the show for so long, he is a massive fan and it is a big coup,’ one show insider revealed. And this is not the only X Factor secret Simon Cowell has let slip lately. Earlier this week the media mogul revealed plans for a supercharged boy band show, featuring performances from some of the biggest in the industry, all in one go. 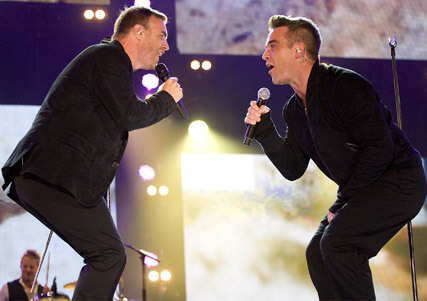 ‘On that night we have Take That, Westlife and JLS all performing on the same show,’ he said of the upcoming episode, set to broadcast on November 14. Would you like to see Prince perform on the X Factor final? Let us know your thoughts in the comments box below.